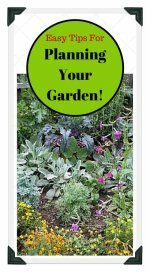 Use our free square foot gardening plans and tips for building this very quick and easy type of garden! 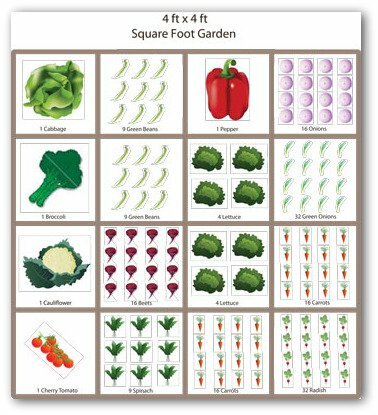 Learn how simple it is to plan and grow a squarefoot garden on a porch, patio, or in your backyard! 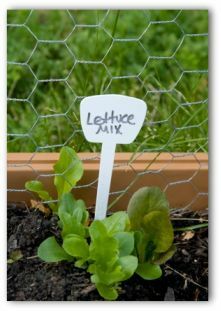 The square foot style garden is a highly organized gardening method that is based on planting in one foot square units. Each square foot is planted with one crop. Four or more of the squares are grouped together into larger 4 x 4 divisions and surrounded by permanent paths. The developer of this great system, Mel Bartholomew, claimed that using wide rows and beds leads gardeners to overplant and in turn become overwhelmed with too much produce. With this technique, vining crops are trellised. 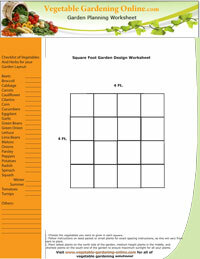 Download our free worksheets for planning your square foot garden! The experts at Rodale Research Center experimented with this set-up and reported this type of gardening to be very productive, especially for salad crops. Using pre-started plants, five succession plantings were harvested during the growing season. This proves a little space goes a long way! 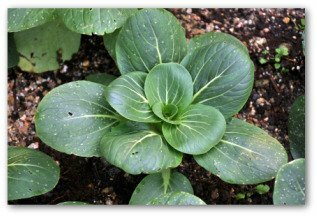 Square gardening is ideal for small-space gardeners in providing a bountiful harvest. Using this procedure, it is possible to produce the same quantity as a conventional garden with one-fifth of the work and space required. Square gardening offers all the advantages of a traditional garden including crop rotation, soil improvement, and companion planting. Choose the plants that fit together in space and growing times. Arrange them like pieces of a jigsaw puzzle to complement each plant's height, growth rate, sun requirements, etc. Utilizing this layout, the idea is to fill each small square with an individual type of vegetable plant. Then plant smaller transplants or sow seeds of low-growing plants, and so on. Combine pairings of plants with differing light needs that grow well together. Of the following pairs, the vegetables on the left prefer full sun while the vegetable listed on the right tolerates shade. When planning close spacing, it helps to consider compatible root systems. The pairings below match crops with complementary root growth patterns. Planted next to each other, roots won't compete and will make the best use of the available space underground. 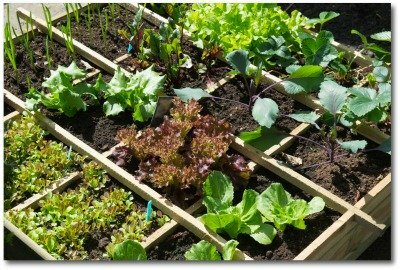 This intensive vegetable gardening scheme makes efficient use of block planting. One type of vegetable is concentrated in a single square foot block. Not necessarily done in square shapes, planting in blocks can also use rectangular forms. Triangle or wedge-shaped plantings within a circular bed are also considered block plantings. 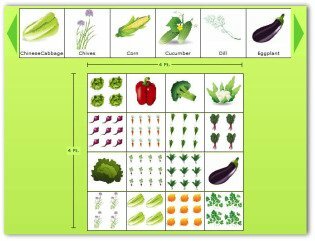 The basic principle involved is that if a certain vegetable does well in a given spacing within a row, it will also fare well spaced within blocks. Cropped blocks simplify planning, are easier to manage, harvest, and replant. They make soil nutrient, crop protection, and water needs uniform for a given site. Gardeners intent on the ultimate in high yield gardening could try the square gardening approach together with 4 to 4 ½ foot wide raised beds. Throw in double digging techniques, and you could have an outstanding vegetable garden factory in the making! 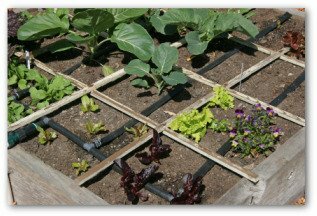 A variation of square gardening calls for combining different plants within each square foot of the garden. 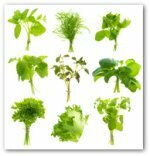 This way you obtain the benefits of interplanting herbs and vegetables. The design helps you work toward maximum efficiency in the use of available garden space.